Shimmering holiday displays adorn Richmond like a bauble-covered Christmas tree. But where exactly are the most impressive decorations to look out for in the city? Read on for our glittering round-up of Richmond’s most magical displays—and see how many you can visit this season. Every year, Richmond decorates for the holidays—and 2018 is no exception. There are more than 650,000 bulbs being deployed by the City this season, including two cool new installations: head to City Hall (6911 No. 3 Road) where you’ll find a pair of gigantic illuminated Christmas balls on display outside. Perfect for selfies, there are also other illuminations on display here, including deer and snow globes. The City also erects illuminated displays at many other public places throughout Richmond, and the waterfront village of Steveston is a particular hot spot. Look out for lovely displays at Town Square Park next to the Steveston Museum, Britannia Heritage Shipyards National Historic Site, and the Steveston Interurban Tram Building, among several others. And while you’re here, check out Steveston’s multitude of Winter in the Village events, running throughout December. 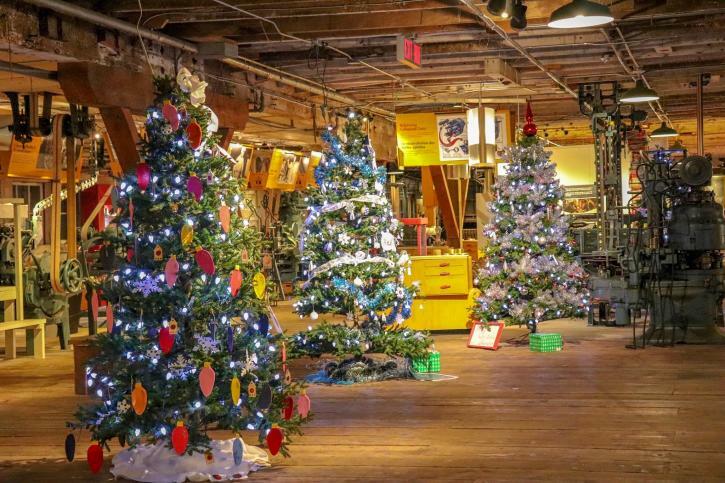 The annual display of brilliantly decorated trees at the Gulf of Georgia Cannery National Historic Site—each from a different local organization or community group—transforms the exhibits here into a smorgasbord of holiday creativity. 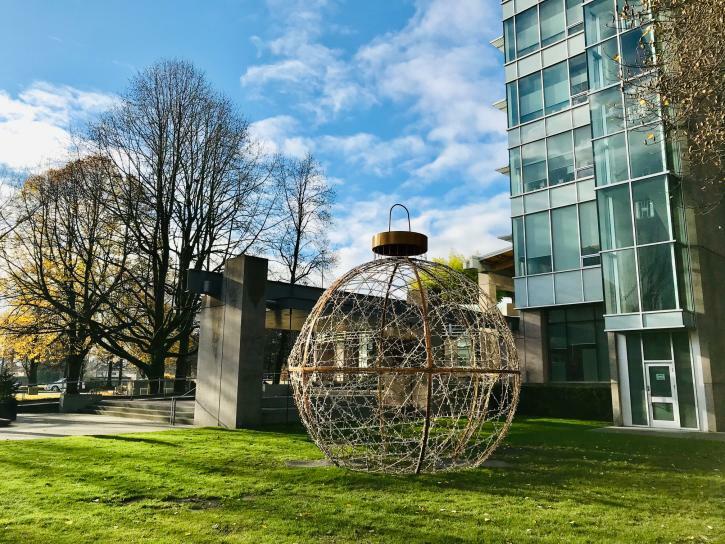 Spend some time browsing the wildly diverse efforts and vote for your personal favourite: the winning tree will be announced on December 16. Regular admission fees apply. One of the city’s biggest shopping malls, Lansdowne Centre pulls out all the stops for Christmas, with a diverse array of Yuletide activities and attractions alongside its sparkling decorations. Look out for live festive music performances, family-friendly craft activities and, of course, the festive tradition of having photos taken with the Jolly Old Elf himself. Santa will be in residence daily until Christmas Eve, with special days for pet photos as well! More details here. Looking for BC’s biggest teddy bear? 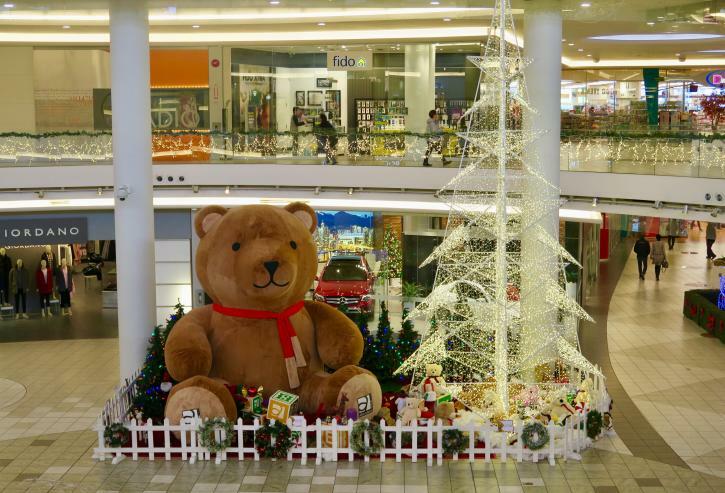 Head to Aberdeen Centre mall where the Central Atrium is home to a humongous furry fella with a friendly smile and a long red scarf. He’s sitting with a huge array of more traditionally sized friends, as well as a dazzling white Christmas tree that stretches two levels up. 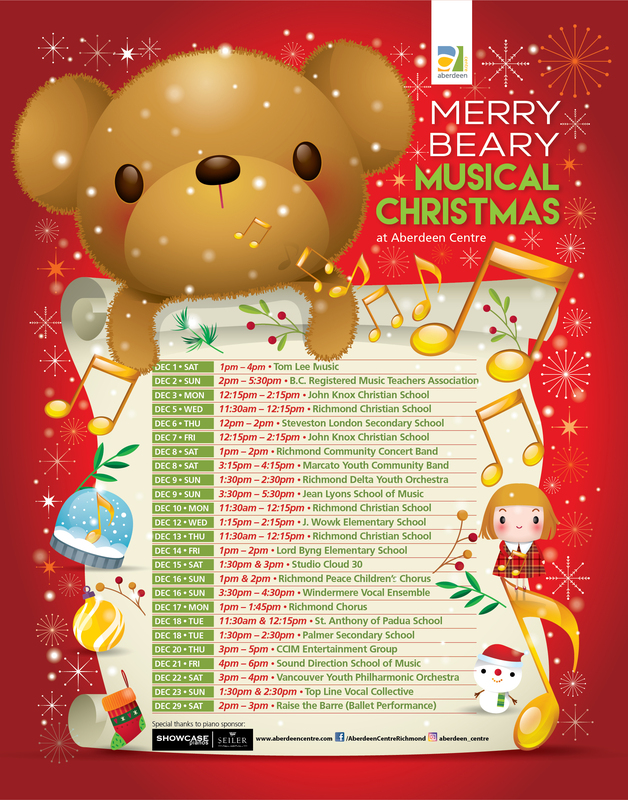 Adding to the fun, there are frequent festive music performances in the mall for much of December—check out the schedule here. It’s hard not to feel festive when you wander among the shiny stores at the region’s most popular designer outlet mall. And while McArthurGlen Designer Outlet Vancouver Airport is a great place for last-minute present shopping, it’s the decorations that really make it feel magical here. The storefronts are traced with sparkling lights, colourful tin soldier sentinels keep an eye on proceedings, and one of the area’s largest outdoor Christmas trees is located here—it&apos;s perfect for snapping a few family photos alongside. There’s no better way to prepare yourself for a long-haul flight over the holidays than with a fortifying cocktail in the bar at this chic airport hotel. Attached to the terminal building, you’ll also find one of the region’s most unusual Christmas tree displays here: an upside down tree that hangs from the ceiling in the lobby like a giant green stalactite. There’s also a shimmering Make-A-Wish Tree of Hope: purchase extra stars for the cause and it’ll shimmer even more! By the magic of Christmas (and perhaps a little extra fairy dust), Santa is also appearing this season at CF Richmond Centre. Book ahead to reserve your spot with the white-bearded-wonder, and then stroll around the mall to check out the beautiful holiday displays—including a giant, illuminated moose. And if you happen to find a few final last-minute presents but don’t have time to wrap them, there’s a popular gift-wrapping valet here that can help.